The Right To Information Act (RTI) stands among the most versatile acts of the Indian Parliament. The RTI is one of the few fundamental rights an Indian citizen holds which gives him the power to know how the tax payers’ money is being utilized by the government. Furthermore, one can file RTI to get answers to several other queries as well. Believe us, a dude recently filed an RTI to the PM asking if “Acche Din” (good days) had indeed arrived! The primary objective of the RTI Act is to empower the citizens of India, provide transparency and above all, make the government accountable to its people. This act mandates that a timely response must be given which makes it the most powerful fundamental right in our country. There are few prime things one has to know about the RTI. Every citizen, irrespective of caste, creed and gender maintains the right to claim information from the government authorities. The RTI Act applies to the whole of India, except Jammu & Kashmir. Except for matters relating to national security, personal information and third party information, information about everything else can be accessed through the RTI. In case an RTI does not receive a response in a timely manner, the Indian Government can impose a fine of upto INR 25,000 or recommend disciplinary proceedings against the official guilty of failing to respond to the RTI. Being classified as a fundamental act, the procedure to file an RTI has been kept quite simple making it easy for our citizens to file one without much ado. 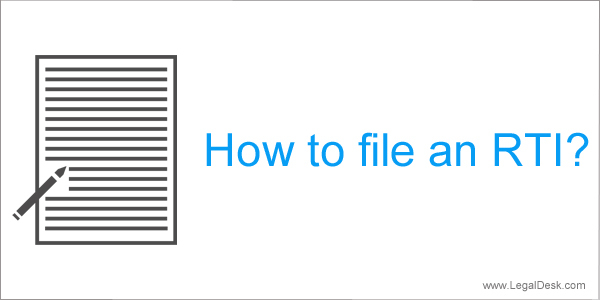 Here are the steps involved in filing an RTI. The subject you have in mind may fall under the State Government, Central Government or a local Municipality. Please keep in mind that if it is a matter that requires discretion, you may not get access to it. Draft your RTI on a plain white sheet of paper. It can either be written or typed in Hindi, English or any other local language used in your region. If it is handwritten, please make sure the text is clearly visible and does not lead to any confusions. Your RTI must be addressed to the State/Central Public Information Officer. Write the name of the department from which you wish to obtain information. You are required to clearly mention that you seek information “under the RTI Act, 2005”. The questions you wish to get answers for must be clearly written out. Make your questions as detailed as possible. It would be ideal if you mention the year or the period in which your request falls under. You are also permitted to ask for relevant documents or excerpts from documents. However, this requires an additional fee or INR 2/- per document. As of now, the fee for filing an RTI is fixed at INR 10/-. This payment can be made in cash, bank draft, money order or court fee Stamp. Such a stamp must be placed on the application. The fee is not applicable to individuals falling under the BPL (Below Poverty Line) category. For them, there is no fee. A copy of the BPL certificate must be attached to the application to receive this concession. As the RTI is an Act which calls for a response, do not forget to mention your contact details including your full name, permanent address, phone number and email address. Place your signature, date and place at the bottom. It is highly recommended that you keep a photocopy of the RTI you prepared for future references. Once you have the RTI ready and a copy kept away safely, you can post your RTI via mail or hand it over to the appropriate department in person. The law mandates that a response to an RTI must be given in no less than 30 days or 48 hours if it concerns an individual’s freedom/life. Should you not receive a reply to your RTI, there is an appellate structure in place to help you speed up things. Your first appeal should be placed to the Appellate Authority. The Appellate Authority is mandated by law to respond within 30 days. Should the Appellate Authority fail to provide you with a reply, waste no time contemplating further. Write to the Chief Information Commissioner or the Central/State Information Commission. This pretty much sums up the procedure to file an RTI in India. The entire process may seem to consume more time. But there are few things that will help you save time. Take a look. As opposed to Bank Drafts or postal orders, court fee stamps take lesser time. Use them instead. Sending your application via registered post ensures that you receive acknowledgement for the post or a receipt. This could come handy in future. If the information you require is distributed among various departments, such departments will internally forward it to each other. When that happens, the concerned person in each department is expected to send you a notice informing about the RTI being forwarded elsewhere and the other departments are mandated by law to provide a response within thirty days. When you frame questions, use simple language and avoid confusing terms. Try to be as direct as possible and explain in detail what information is required. As technology advanced, the Indian Government has always made efforts to try to keep itself up. Today, online portals allow the common man to create, pay for and file an RTI from the comforts of his home. This has proven to be very useful in the recent years as it has made the whole process simple. To find out how to apply an RTI online, kindly contact us and we’ll be overjoyed to assist you with it. 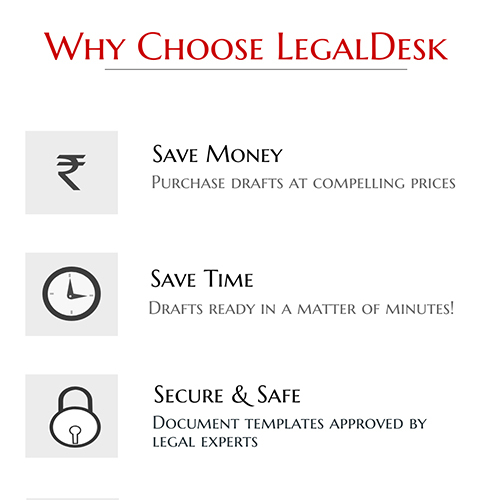 We also have a host of other verified, pre-drafted online legal documents. Please feel free to use them to create documents in minutes and have them home delivered!